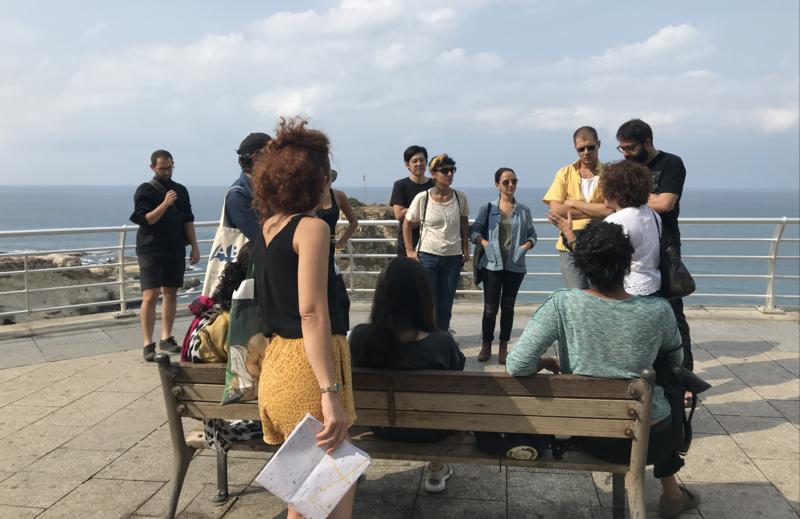 The 8th edition of the Home Workspace Program (HWP) consists of 6 workshops led by visiting professors: Celine Condorelli, Yasmine Eid-Sabbagh, Iman Issa, Maha Maamoun, Suhail Malik and Joe Namy and a course of seminars taught by guest professors; Lawrence Abu Hamdan, Mirene Arsanios, Monika Halkort, Francis Mckee, Walid Sadek, and Akram Zaatari as well as tutorials with Walid Raad. 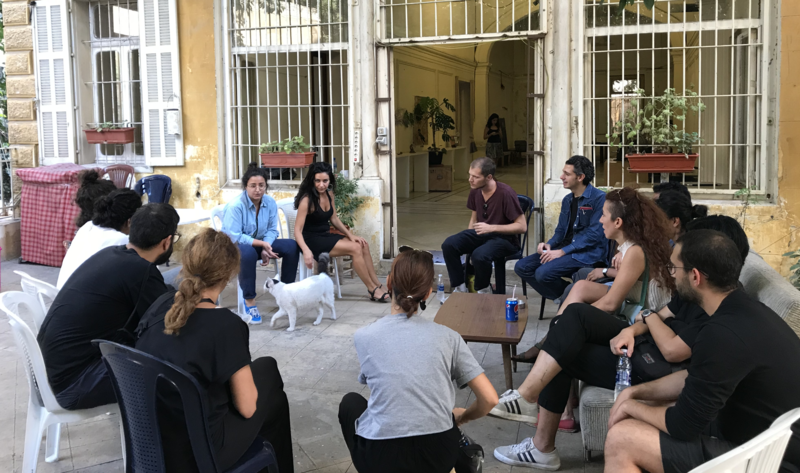 The program begins with a two-week Preface led by Rayyane Tabet, offering an in-depth introduction to the program, as well as to Lebanon’s urban and cultural landscape, conducted through site visits and discussions with invited guests. The Preface is followed by six Workshops led by Visiting Professors (VP). The VPs are invited for an extended period of time, alongside guests of their choice, to explore forms, themes and media affined with their distinct artistic practices. In parallel, the Seminars explore concepts, histories a, d practices close to the guest’s current or former areas of interest. As with every year, there will be three group critiques throughout the year with invited guests, as well as the end-of-year Open Studios. Joe Namy and Haig Aivazian are this year’s advisors. The Advisor is a mentor and tutor to the HWP fellows throughout the duration of the program. The Preface, entitled The Urban | The Legal | The Narrative, proposes an in-depth reading of one archeological site, two books, three neighborhoods, and four institutions to uncover the relationships between urban conditions in and around Beirut, their legal ramifications, and narrative potentials. This workshop will focus on creating and decreation. Through a series of exercises, readings, and site visits, we’ll explore, discuss, and practice various approaches to art making with a focus on the ephemeral, and the kind of enduring impact a fleeting work of art is capable of achieving - corporeally or mythically. We’ll take a critical look into the precarious relationship between art and permanence, and the kinds of pressures and challenges that arise in making unlasting work, using key examples of public art, happenings, and interventions in Beirut as a jump off. During the course of the workshop, we will be looking at different conceptions of abstraction and the systems from which they emerge. Thinking of abstraction as a thought and material process that outlines figures, functions, and a creative agency, we will be concerned with the forms it might take, while also thinking what might constitute a generic form at this moment in time and how, in turn, it might relate to or be distinguished from other forms of abstraction. Publishing is increasingly being discussed and explored as an artistic practice. Self-publishing, whether by artists or others, has been a route taken to challenge the control and standards maintained by the gatekeepers of the day, with their stylistic, financial, legal, and ideological restrictions. Yet the space that self-publishing, and by extension other artistic practices, is able to carve up for itself in what remains of public space seems similarly infiltrated and confined. Through this workshop we will explore, taking (self)publishing as a point of entry, “the space that remains” for artistic practices outside of dominant systems of production, circulation and judgement – and in what ways these alternative practices challenge or recreate the beast. The term Anthropocene was popularised in the early twenty-first century to designate that human civilisation has become a geological force. Our impact on the planet’s material organisation is irrevocable and increasing. It’s now well known that the conditions that made human habitation on the planet possible are already under severe duress and maybe even under catastrophic change. The future of the planet over the span of millenia is completely uncertain. Yet action has to be taken now. But how to take action when it is the unknown future that must determine what takes place now, and at a planetary scale? The workshop will address this complex question, made more difficult yet by the imponderable time-scales that the Anthropocene imposes on the very notion of action. As a venue of public experimentation, art could take a leading role in testing the new configurations of materials and ideas that will be required to meet the future-based reordering set by the Anthropocene. But the task is yet more vexing for art: if it is to take any role in these coming challenges, art cannot do so on the basis of experience, subjective valorisation, the archive, micro-interpretation, formal revision, and communal recollection, which have together comprised the basic premises for contemporary art. The uncertainties of large-scale time sequences supplant these experiential constraints for art’s engagement with the planetary future. This workshop explores the issue of problematic inheritances, starting from specific case studies. Inheritance is here understood in a wider sense, not as material goods coming from kin, but as fragments and parts of the world that we care for and take care of towards a possible future to be shared with them. To think of a legacy in terms of what is communicated - and communicable - and what is less so; both in terms of a troubling (or troubled) past or an uncertain present. This is a question that allows for problematizing transmission between generations, and between places and times. The workshop will work towards learning how to raise and then expose the problematics of how things (and practices) come into being, how they come into the world, and then to us - and through that how they narrate the movement of people but also of goods, of capital, of power, of ideas, of artworks and of information. It will open this up by thinking of forms of display: how things are shown (in exhibition contexts, in the world), and therefore how their appearance in the world can be problematised, unfolded, questioned, or concealed. We will look at monuments, books, memorabilia. Taking the tradition of marginalia -the clarifying or personal readings running alongside texts that used to be part of publishing before the voices of others were relegated to footnotes- we will practice commenting as a way of working with inheritance and legacies. Investigating into critical artistic/archiving practices? In the context of a world shaken by wars, ongoing conditions of coloniality and oppression, economization and environmental destruction—all of which bring about new forms of migration and thus an array of challenges in society—what expectations do we have towards artistic and archiving practices? By combining questions around the performativity of images and critical archiving, this workshop aims at investigating the social, political, economic, and ethical contexts and dimensions of these practices. Which social contracts are contained within an archive? What are the hidden rules of its collections? What kind of images and stories are being stored and which are excluded? To whom do these archives belong and who has access? Which images circulate? And how does the circulation of images perform and eventually shape our daily perception? Can we investigate their hidden agendas through performative practice? 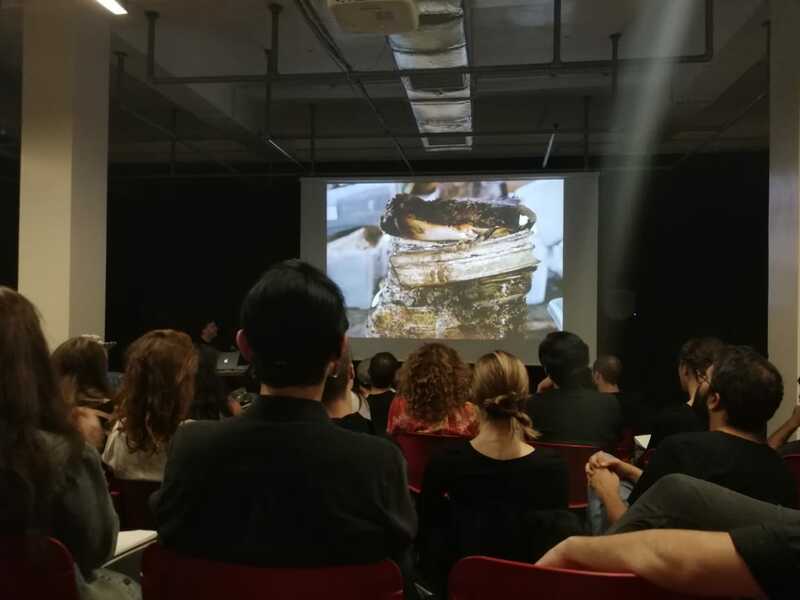 By close viewing of diverse materials, field trips, and performative interventions, we will critically reflect on various artistic and archiving practices and their conditions of production. 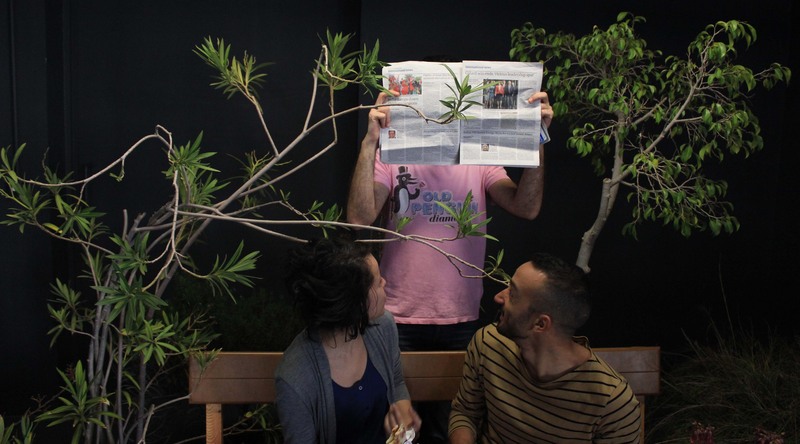 Haig Aivazian is an artist, curator and writer born in Beirut in 1980. Using performance, video, drawing, installation and sculpture, his work weaves together personal and geo-political, micro and macro narratives in its search for ideological loopholes and short circuits. Aivazian holds an MFA from Northwestern University and is a Skowhegan alumnus (2011). Céline Condorelli lives and works in London, Lisbon, and Milan; she is currently Professor at NABA (Nuova Accademia di Belle Arti) Milan, and one of the founding directors of Eastside Projects, Birmingham, UK; she is the author and editor of Support Structures, published by Sternberg Press (2009), and her first monograph, bau bau is published by Mousse (2017). Recent exhibitions include Proposals for a Qualitative Society (Spinning), Stroom Den Haag, NL, Corps á Corps, IMA Brisbane, Australia (2017), Gwangju Biennale, Liverpool Biennial, Sydney Biennial, and Concrete Distractions, Kunsthalle Lissabon (2016), bau bau, HangarBicocca, Milan, IT (2015), Céline Condorelli, Chisenhale Gallery, UK, Positions, Van Abbemuseum, NL, including the publication The Company She Keeps, with Bookworks (2014). Yasmine Eid-Sabbagh studied history, photography and visual anthropology in Paris. She received her Ph.D. from the Institute for Art Theory and Cultural Studies at the Academy of Fine Arts, Vienna. From 2006 to 2011 she lived in Burj al-Shamali, a Palestinian refugee camp near Tyre, Lebanon, where she undertook photographic research, including an oral project with young Palestinian refugees and archival work on family and studio photographs. She has been a member of the Arab Image Foundation since 2008. For her collaboration with Rozenn Quéré, Vies possibles et imaginaires (Editions Photosynthèses), she received the 8th Vevey International Photography Award in 2011 and the Arles Discovery Award in 2013. Iman Issa explores the relationship between history, memory, language and objects. Her recent work explores the notion of individual experience and how it is linked to the collective. In her practice, she detaches and deconstructs events, characters, and places to create something new, with new eyes. Maha Maamoun is a Cairo-based Egyptian artist. She is interested in examining the form, function and currency of common cultural, visual and literary images as an entry point to investigating the cultural fabric that we weave and are weaved into. She also works collaboratively on independent publishing and curatorial projects. She co-founded the independent publishing platform called Kayfa-ta in 2013. She is also a founding board member of the Contemporary Image Collective (CiC) – an independent non-profit space for art and culture founded in Cairo in 2004. Suhail Malik is Co-Director of the MFA Fine Art, Goldsmiths, London, where he holds a Readership in Critical Studies, and was 2012-15 Visiting Faculty at CCS Bard, New York. Recent and forthcoming publications include, as author, On the Necessity of Art’s Exit From Contemporary Art (2017) and ‘The Ontology of Finance’ in Collapse 8: Casino Real (2014), and, as co-editor, Realism Materialism Art (2015), Genealogies of Speculation (2016), The Time-Complex. Postcontemporary (2016), a Special Issue of the journal Finance and Society on ‘Art and Finance’ (2016), and The Flood of Rights (2017). Rayyane Tabet was born in 1983. Tabet's work explores paradoxes in the built environment and its history. His sculptures often reconstitute the perception of physical and temporal distance. He lives and works in Beirut.